Cream soups often contains high carb thickeners. 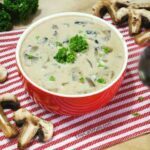 This gluten free low carb cream of mushroom soup uses a natural gum thickener instead. It’s the start of November and the winter weather will soon arrive. With the colder temperatures, we are always in search of comforting food to warm up. 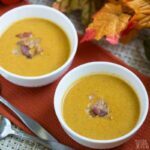 Soup is an easy dish to make and it’s a welcomed meal in winter. I wanted to try some of the stir fried wild maitake mushroom that made earlier in a soup. 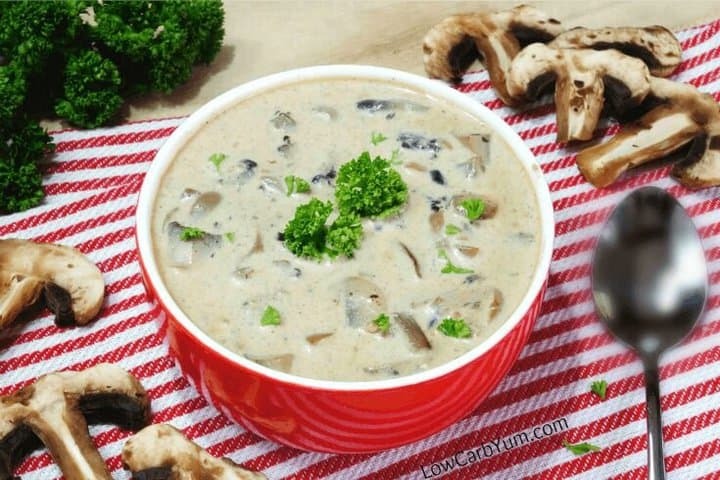 Cream of mushroom is a popular soup and the condensed version found canned is a favorite casserole ingredient. To make the soup lower in carbs, I used guar gum as a thickener instead of flour. It worked well. 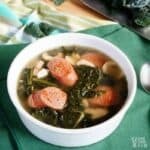 If you would like to use this soup as a substitute for canned soup as a recipe ingredient, I’d suggest adding more guar gum or xanthan gum and then cooking it down to remove at least half the liquid. Once condensed, it should make a good low carb cream of mushroom soup substitute for the high carb canned stuff when making things like green bean casserole. I ended up chopping up the wild mushrooms in the food processor. They tasted wonderful in a creamy soup recipe. In fact, the low carb mushroom soup was so yummy, I made another batch using regular button mushrooms. This recipe will need to be tested a bit for casseroles. 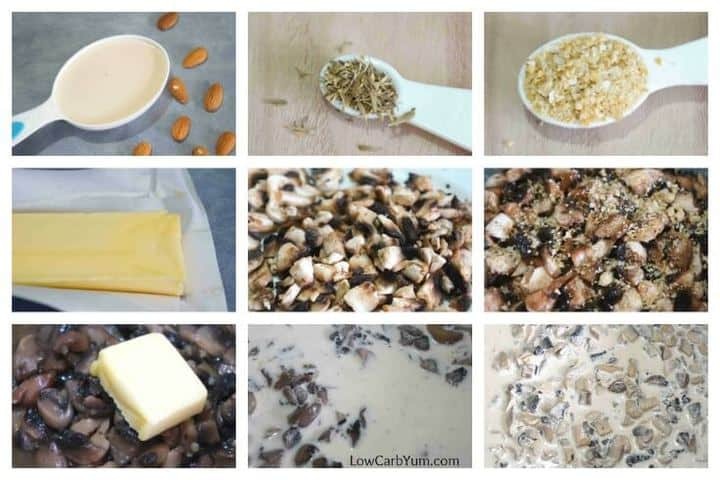 I’m interested to see how it works as a condensed low carb cream of mushroom soup in place of the popular canned soup. If it doesn’t work out, there must be a way to use a thickened heavy cream mix instead. When moving to a low carb diet, less processed foods are used and more whole foods are consumed. Making soups and other dishes are not as difficult as I once thought. It is nice to have the convenience of box mixes and frozen foods, but it’s not worth the health issues that the bad ingredients can cause. 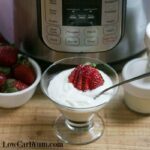 I’m sure this cream soup can be made in larger batches and frozen for easy meals later. I’ve had good success in freezing sauces. so soup should also work. It’s really not too much work to make your own frozen meals. 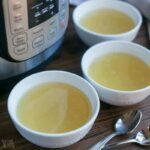 This is a quick cooking soup. Although I cooked it on the stove top, it may also be well suited for the slow cooker. Sometimes, I prep things in freezer bags for dumping in the crock pot on busy days. It’s a great way to have a hot cooked meal waiting at home after work. Sometimes, I prep things in freezer bags for dumping in the crock pot on busy days. It’s a great way to have a hot cooked meal waiting at home after work. My family refuses to eat mushrooms. I have no idea why. 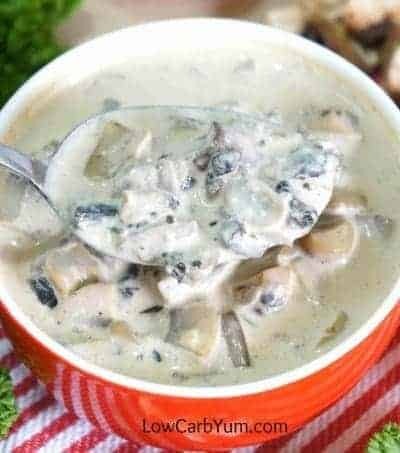 If they tried this low carb cream of mushroom soup, they’d be sure to love it. They add great flavor to so many dishes. It may be the fact that they are a fungi and grow in dark moist areas. Kind of creepy to the kids. 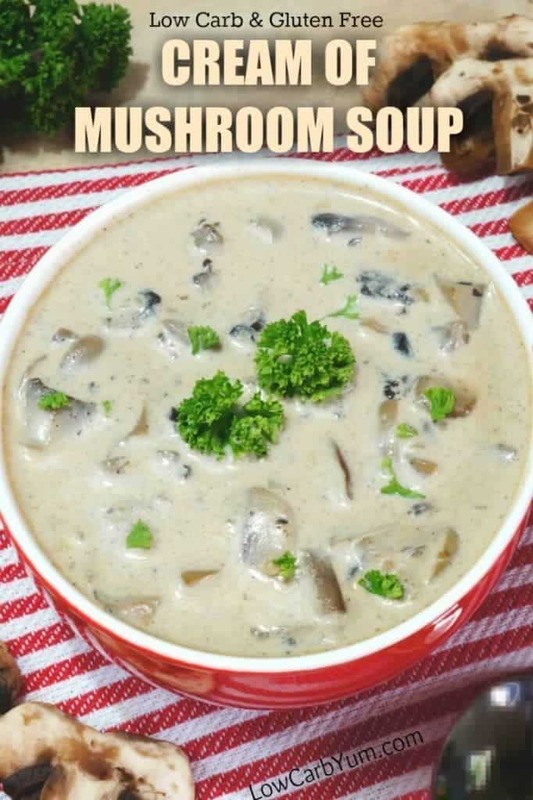 I hope you give this tasty mushroom soup a try. 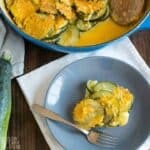 It’s super quick and easy to make and is a comforting dish to eat in fall and winter. If you’ve got other delicious ways to cook mushrooms, I’d love to hear some of those ideas in the comments! Cream soups often contain thickeners which add unnecessary carbs. 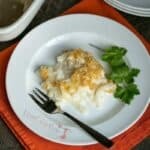 This low carb version uses a low carb thickener instead. Combine mushrooms, broth, onion and thyme in large saucepan. Cook about 10 to 15 minutes. Add butter. Sprinkle in guar gum and whisk until blended in. Add the salt, pepper, heavy cream, almond milk, and cooking wine. Stirring frequently, bring soup to a boil and cook until thickened. Adjust seasonings to taste. Made this the other day to use with another recipe that I would have originally used a tin of Campbell’s cream of mushroom soup with. This soup tasted so good, I’m making it again to eat as soup. 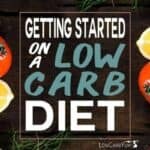 Definitely Low Carb YUM! Thanks for the feedback Cathy! I’m so glad the soup worked out for you. Yes! Stay far away from those canned cream of mushroom soups. I noticed some users asking about xanthan gum instead of guar gum. Bob’s Red Mill site on the subject of xanthan vs guar has an equivalent chart for every usage of the thickeners. Basically you use less xanthan gum than guar gum. It might be helpful. Made the soup. Very good! Thanks for the info Anita! I tried the recipe. The flavor is great but the texture is a little to gummy for my taste. The next time I make it I will use 1/2 the amount of xanthan gum. I prefer it be more creamy and milky. That being said, the soup has wonderful flavor. I also like the smaller amount for the recipe since its only two of us. Thanks. Sometimes it is best to add in the gum a little at a time. And, if you don’t really care for a thick soup, you can leave it out. Is the 1 1/2 C. mushrooms measured before cooking them or after? Any substitution for the almond milk.? You can use coconut milk, or a half/half mix of heavy cream and water. I see this makes 5 servings. How much is each serving? One cup? Making this tonight but am making a double batch at least! Yes. Each serving is about 1 cup. I had to order xanthum gum online. It was sooo worth it! The flavor is amazing! Don’t skip on the white wine! It adds a nice touch of flavor. This recipe is a keeper. 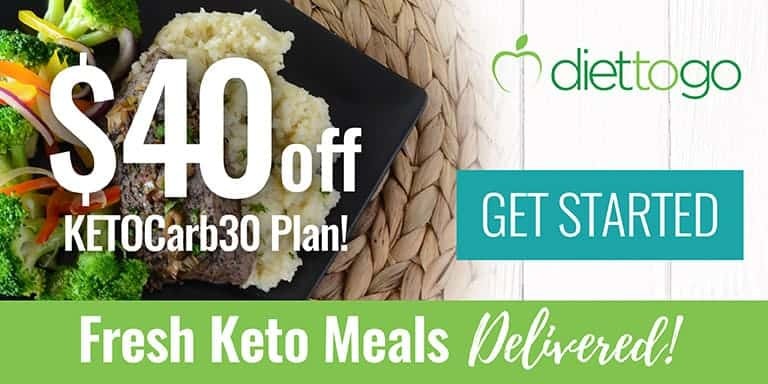 It’s one of the best low carb thickeners. 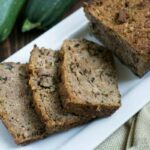 I also use glucomannan, but it doesn’t work as well as xanthan gum. Could you use xanthan gum instead of guar gum? And how much would you use? 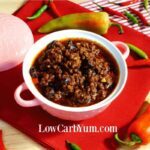 You can use any low carb thickener. I typically just sprinkle them in until a good thickness is reached. I made this today and used it in a recipe as cr of mushroom soup. It tastes great. I will make this again. Good to know it worked as an ingredient for you! 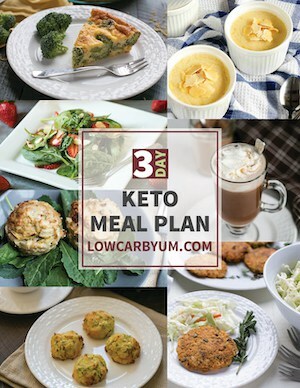 Thank you for posting this recipe, it was delicious! 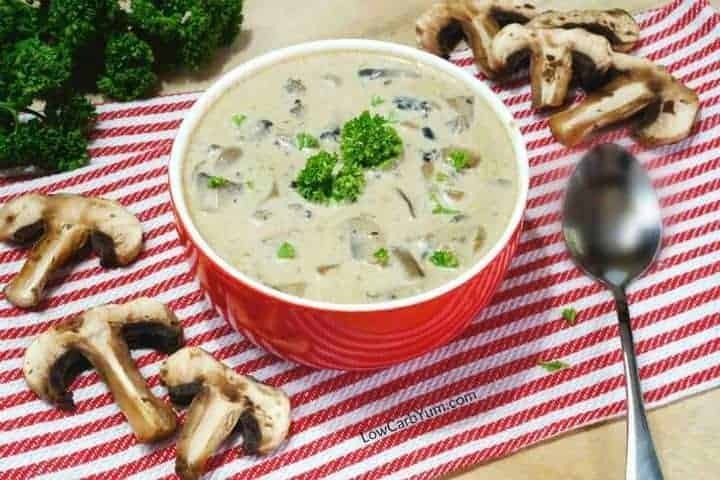 Cream of mushroom soup is one of my favorite dishes and I am glad that I don’t have to give it up now that I am following a ketogenic lifestyle. This is definitely going to be a staple in my kitchen. I used sheepshead which is an easy mushroom to identify. Hi, is there a significant need for the guar gum? There isn’t in this recipe. It’s only used as a thickener. Sounds delish and so easy. Can’t wait to try thus recipe. I think it’s yummy. Hope you do too! It’s about 1.2g net carbs. I also believe the carbs listed are a bit high on the recipe. Thank you!! It’s absolutely delicious! Truly a success! 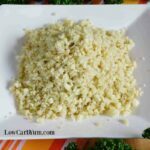 Can i use xanthan gum instead of guar gum? You can. It’s just an ingredient used to thicken the soup. What can you use in place of the white wine? You could try a little lemon juice or vinegar. Can you tell me where you buy these beautiful looking mushrooms? These mushrooms grow wild in the area where I live. We just go out and pick them. They are a beginner mushroom as there are no toxic mushrooms that look like them so you can be sure you are getting an edible mushroom when you see it.